Sharp drops in total call options represent expiration dates. Open interest is the total number of wheat contracts at any point in time. Open interest spike #1 and #2: Option market makers (OMM) are caught off guard by rally in wheat. They increase open interest 34% keeping prices down through September 2007 expiration date and reposition themselves for rally. When prices soar as OMM buy back the counterfeit supply they flooded the market with. Open interest spike #9: Again, OMM are caught off guard by rally in wheat. They increase open interest 28% to kill rally in wheat and enlist the aid of the USDA to kill wheat prices with bogus production estimates. With June expiration over now and OMM successfully repositioning themselves, expect USDA numbers to start reflecting reality again and wheat prices to soar. It would appear that they are now concerned that they might have overstated things [Yes, with June option expiration over, the USDA is getting ready to adjust their numbers to reality]. So we are now left in limbo until they issue their revised wild stab in the dark on August 12th. My reaction: While all this may be confusing, with terms like "open interest" and "option expiration dates", once you understand these terms, the manipulation of wheat is crystal clear. 1) With June option expiration over, the USDA is getting ready to adjust their numbers to reality. 2) Option market makers use spikes in open interest before expiration dates to reposition themselves, generating profits where they might otherwise have experienced a loss. 3) Volatility increases the prices of options. This is because sharp market swings make investors nervous and willing to pay higher premiums for the insurance provided by options. So the general pattern of spikes in open interest before expiration dates also represents attempts by OMM to milk extra premiums from rattled investors. 4) The manipulation of wheat probably closely resembles the manipulation of other commodities. Conclusion: Any person with market experience can look at the two charts above and tell that something is seriously wrong with US futures markets. 1) By artificially and drastically increasing supply of wheat futures in the summer of 2007, options market makers delayed the price rise in wheat. When this artificial suppression of wheat ended, wheat prices soared as open interest shrank. If OMM hadn't manipulated the markets in summer of 2007, the rise of wheat prices would have started earlier and would have been more orderly. 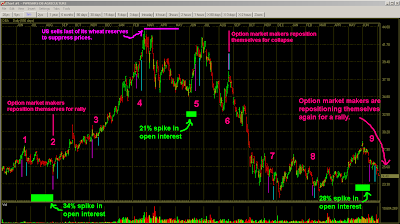 2) Option market makers again artificially increased the supply of wheat by 28% before June option expiration. Once option market makers have repositioned themselves and the manipulation ends, wheat prices will soar like they did in 2007. Sorry, but I still don't get it. How can you *profitably* manipulate a free market the way you describe? Option market makers sell millions of out-of-the-money call and put options every month. As long as prices don't swing wildly in one direction or another, these options expire worthless and OMM keep money received as profits. OMM are essentially selling insurance against sharp market swings. 1) They delay price movements for a couple of months, avoiding having to pay up on options already sold. 2) Since they know prices will rise/fall when the manipulation is reversed, they take advantage of this knowledge when selling options on subsequent expiration dates (ie: reposition themselves for the market swing). Look at the charts above. 1) If OMM hadn't increased open interest by 34% between point 1 and 2, what do you think would have happened to wheat prices? They would have risen, and OMM would have been forced to pay out huge amounts to make good on the "insurance" sold, turning the profits from selling call options into horrible losses. 2) Additionally, since OMM knew that prices would fall when they bought back the 34 percent, they stopped their sale of call options (insurance against rallies) for subsequent expiration dates and focused on selling puts (insurance against price declines). So when prices did rise dramatically between points 2 and 4, option market makers were prepared and didn't experience any losses despite the massive rally. You *may* fool the one or other options buyer, but on the futures side, everyone could step in and profit from your market "manipulation"... ??? Option market makers are Wall Street's biggest financial institutions (Goldman Sach, etc...), with strong influence on the media and government agencies. Their manipulation is huge in scale and is timed to coincide with news stories and government data which support their actions. For example, the 28% spike in open interest this June coincided with the release of bogus USDA data and bearish news stories. Against this sort of co-ordinate large scale manipulation, it is very difficult for "everyone to step in and profit from the manipulation", especially if most people don't even realize what is going on. This entry was posted in Background_Info, Financial_Wizardry, Food_Crisis, Market_Skepticism, Wall_Street_Meltdown. Bookmark the permalink. Mark, I added the responces to your questions to my entry above. I hope my answers made things clearer.